It all started with a twist of fate. Followed by a subtle shock to the system. Then an embrace in the heart. After awhile, a change from deep within. And finally, you move on. Like it was just any other day. 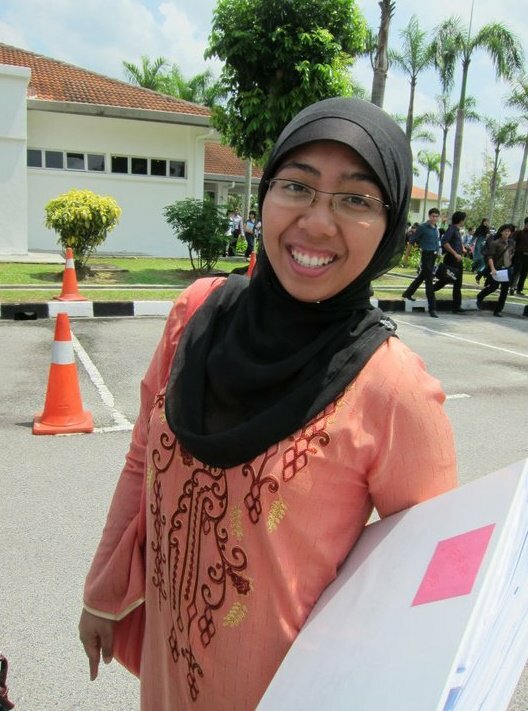 To be honest, if it wasn't because I had gone to IIUM in the first place, I would probably still remain Hijab-less. Trotting around in my summer dresses or plunging neckline shirts. Hence, like I said, it all started with a twist of fate. A blessing in disguise even though the decision to wear it came all of a sudden with my admittance into IIUM. I was still getting used to the new look. Frankly speaking, it wasn't easy. I had to change my wardrobe (a good reason to go shopping though! ), figure out which Hijab style suit me best, at the same time having doubts whether I made the right decision or not. There were days when I missed looking at the old me. The one who could wear whatever I wanted, getting the hair blown by the windy air and those summer dresses that I loved were still kept inside my wardrobe. I still played dress-ups with those dresses in front of the mirror. On my own, of course. It got worst when I was having a good hair day but I can't seem to walk around outside with it. I think it's perfectly normal to feel that way especially if you just started wearing it. It was after all, a subtle shock to the system. You cope with it in different ways. Though I felt the best decision I ever made was not when I first decided to wear the Hijab in IIUM. Instead, the best decision I made was when I decided to continue wearing it even after I have left IIUM for good. The initial reason I wore it was because of the university's requirement then the second reason to continue wearing it was because it didn't feel right to only wear it inside the university compound and take it off elsewhere. But when I left IIUM, I wasn't tied to the initial reason anymore therefore was free from the second reason as well. I could easily un-don the Hijab if I wanted to. Because by then I already embraced it in my heart. I finally got my niat right. Now, I'm wearing it not because of some official requirement or rules but because I want to. I do it for myself but most importantly, I do it for Allah, too. He has given me so much in the past years that it is only fair of me to realize how blessed I've been and walk on the path to become a better Muslim. The path hasn't ended, though. I've a long way to go. There is plenty of room for improvements for me. From the clothes I wear to my words and actions to my niat and obligations. I can only hope this first year of wearing the Hijab also marks a better me. I'm here now. And I'm here to stay.